no other engineered surface offers more textures than tfl. Photo by Kenn busch photography. all rights reserved. Also Known As: Melamine panels, MFC (melamine-faced chipboard), low-pressure laminate. Specified as components for furniture and decorative panels for interiors, TFL panels have durable paper-based decorative faces in solid colors or high-fidelity woodgrain, stone, tile or other printed designs. They use a composite wood core, usually particleboard, Matching edge treatments are used to band exposed TFL panel edges during fabrication. The decorativefaces are printed or solid-color décor papers, treated with a special thermosetting melamine resin system that bonds to the substrate under heat and pressure. This process fuses the decorative surfaces to the panel without the need for a separate gluing step. The resin system also provides scratch- and wear-resistance similar to that of HPL. Most TFL panels carry textures that enhance the printed design, creating a very realistic decorative surface that can convincingly replace fragile and rare veneers. TFL panels in woodgrain designs are widely used in applications where veneer or solid wood are just too fragile or expensive, but designers still want the feel of fine wood. No other manmade decorative surface is as effective in evoking finished or raw wood surfaces. TFL might just be the most responsible decorative panel available. They are incredibly efficient to produce, are made with better-than-carbon-neutral composite wood cores that utilize wood fiber that is otherwise landfilled or burned. TFL panels replace fragile and rare wood species with a far more durable, cleanable, and ultimately replaceable surface. One major TFL advantage for A&D specifiers: the ability to replace a wall panel with an exact color and character match, years after the original installation. 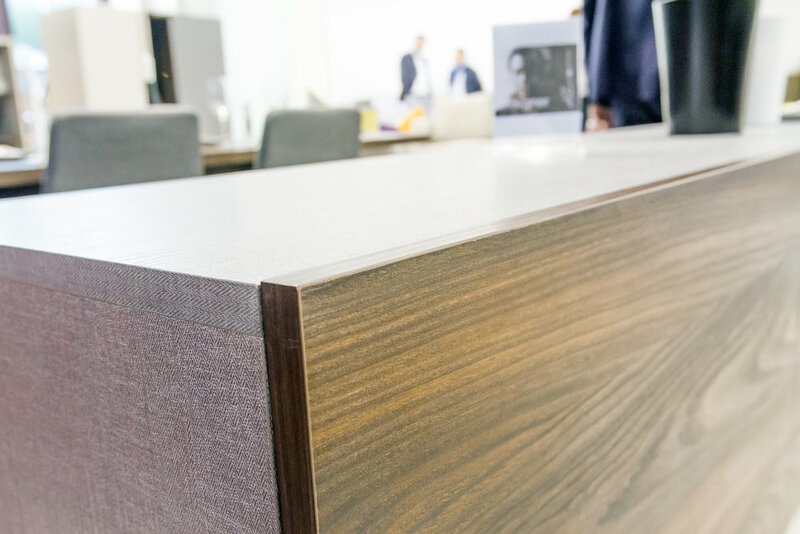 With solid wood or veneer, it’s impossible to match the color and character of a damaged panel. + Where is TFL used? Commercial: The durability of a finished TFL panel depends largely on the quality of edge applied during fabrication. Most TFL fabricators can edgeband square and shaped panels with matching edge treatments suitable for work surfaces, casework, door and drawer fronts in office, healthcare, hospitality and other high-use applications. In these settings TFL components easily outlast wood and veneered components. Residential: Kitchen and bath cabinet cabinetry, closet systems, entertainment centers and home office worktops in TFL are a beautiful, durable alternative to solid wood and veneers. TFL’s decorative faces are thermally fused to the panel core; they are not glued on. TFL’s wear- and scratch-resistance is comparable to that of HPL. Enhanced wear- and chemical-resistant surfaces are available. Edge treatments are required to protect the surface integrity of TFL panels. Panel faces are water and moisture resistant, unlike veneers. Special cores may be specified for moisture and fire resistance, reduced weight, enhanced screw-holding strength and other properties. TFL panels are often used as a more durable, economical alternative to veneered wood panels. Surface Visuals: Décor papers used in TFL are essentially the same as for HPL. They’re printed on décor papers either on rotogravure or digital inkjet presses with water-based inks. The printing system must be compatible with downstream process – saturating the papers with resins, and pressing them to the composite wood core. Textures: Woodgrains, gloss/matte variations and other texture effects are imparted to the surface during pressing, using either engraved steel plates or textured release papers. Some of these textures may be “synchronized,” meaning the “ticks” in a woodgrain texture, for example, align perfectly with woodgrain details in the décor paper. TFL can carry deep stone and wood textures, as well as the feel of unfinished, raw wood. No other manmade decorative has as many texture options. Shapes/Form: TFL panels have flat faces and may be machined into non-rectangular shapes. Edges: Straight edges may be postformed with special CNC machinery that carves a radius in the edge and wraps the surface around it. Matching or complementary edgebanding in other materials is available in various thicknesses. Matching Materials: TFL producers publish guides to design matches in complementary materials – 3DL, HPL, decorative paper foils and edge treatments. TFL is commonly combined with 3DL to increase design flexibility. TFL substrates are composite wood panels, usually particleboard, although MDF and plywood may also be specified for their unique properties. Decorative faces are printed or solid-color décor papers, impregnated with a thermosetting melamine resin. The resin system melts under heat and pressure in the press and flows to the substrate. As it cools the resin crystallizes and creates a permanent bond between the decorative surface and the substrate. Surface textures are created in the melted resin during pressing by engraved steel plates or textured release papers. Panels emerge from the press with decorative faces on the top and bottom. Substrate edges are still exposed after pressing, and require edge treatments if they are to remain exposed after fabrication and installation. TFL panels require treatment of any exposed edges to maintain surface integrity. Fabricators will size, shape and edgeband TFL panels to order. Cabinetmakers and installers can size and edgeband TFL panels in the field. TFL panels are based on composite wood cores that use recycled wood fiber that would otherwise be landfilled or incinerated, Composite wood panels made in North America have composite wood cores that have been found to be “better than carbon neutral,” sequestering more carbon than is expended in the panel’s manufacture from cradle to gate. The material’s realistic woodgrain visuals and textures allow designers to use replace fragile and rare woods and veneers with more durable, design-consistent and cost-effective TFL panels.